The main purpose of this competition is to show the Japanese traditional culture to the world by talking the opportunity of 2020 Olympics(Games of the XXXII Olympiad). By creating design or pattern that can express the worldwide culture and tradition in kimono, we aim to encourage the interaction between cultures. As a theme of design, we look for drawings, which express the distinctive culture, scenery, nature and tradition of these intended nations below. Since there will be 2020 Olympics(Games of the XXXII Olympiad) at Tokyo in 2020, participating countries are targeted specifically. The design or pattern of Furisode (full-length kimono), subject of 2020 application countries. *If you are applying in a team (school), you still need to choose only 1 country. *If you are applying individually you may apply single design, please do not mix the contents of several countries. -2. Number of the design: In school basis, less than 5 designs (1 design for 1 person). Individual is 1 design for 1 person. -3. There is no regulation for age or profession. As the Olympic and Paralympic Games in Tokyo in 2020 will be held, there is “Host Town” approach in local government to deepen exchanges with other countries. To contribute to this Host Town project, we accept just 1 country as host-town category. Applicable area: Schools or residents in Kanagawa prefecture. Those concerned with the State of Eritrea. *Please fill the application form and mail or bring it directly. *Please write comment (statement, purpose, the source of your idea) on the application form. *Please understand that all designs will NOT be returned. *You cannot apply for the copy or color-different pattern of existing kimono. *Merchandised Kimono photos are invalid. *Designs that are considered to have an infringement of copyright will be out of selection. *We only accept designs that have not been sent to other competitions. Send your paper artwork to us. Both by email and mail are accepted. 1. Confirm your design’s format. Both scanned data of handwritten sketch and computer painted data are OK ! * Please make sure your data’s resolution is over 120dpi and within 3M in JPG format. 2. Finish your application form. 1. Complete your application form. 2. Send us your design by mail ! It will be announced to applied school or individual by the end of June 2020. -Souvenir: The winner will be given the certificate of merit and souvenir. -Kyoto exhibition: There will be exhibition at Kyoto International Exhibition Hall (Miyako Messe) on 23rd and 24th October 2020. *The exhibition is planned to take place at other parts of Japan. Below, we picked up those most concerned questions, hope this will help you ! Although there is kimono and other products like tapestry that have possibility of turning into a trial kimono product, we will not use for sale. it is the trial product. Since our organizational mission is cultural exchange and to develop and improve the art of dyeing and weaving, not making product for commercial purpose; no design will be used for sale. The winner will be given the certificate of merit and souvenir (textile-related goods) in mid December. The copyrights of the winning design belong to the winning designer. 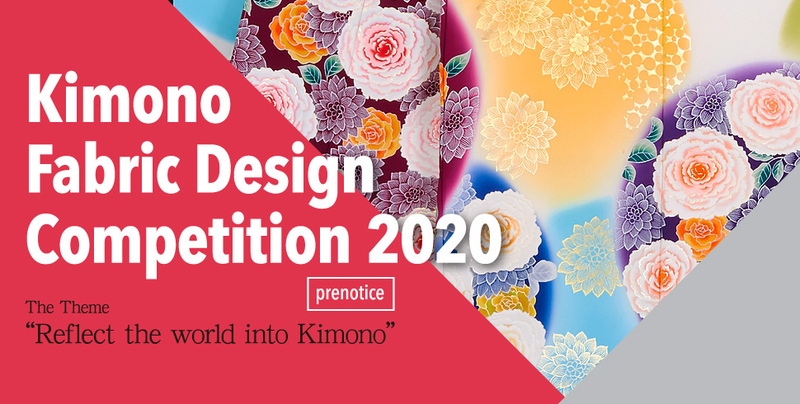 The winner agrees to grant the use of the winning design under the condition, period, and areas described in the following section to Organizing committee of the Kimono Design Competition. 2-1) Winning design will be displayed in the exhibition held by Organizing committee of the Kimono Design Competition in the period determined below (Up to 6 times per year). 2-2) Trial works like kimono and tapestry will be made based on the winning design with the utilization of Yuzen technique. Depending on the types of trial works, there might be changes in design during the process. In the occasion that significant arrangement have to be made, we will ask for your approval. 2-3) Winning design and the trial works made based on the design will be displayed on the website, pamphlet, introduction paper, etc. 5) The trial works and pamphlet won’t be sold in any case. Our purpose is to ‘cultural exchange’ and ‘improvement and development of Yuzen technique’. Moreover, every design we will be kept carefully and will not be sold under any circumstance. We will distribute certificate and prize to the winning designers. The prize will be: original Yuzen-related goods worth are 50,000 JPY to the 1st designer and 30,000 JPY to the other winning designer. Please notify that this is in exchange with of the copyright under the condition, period, and areas described earlier. Have you ever heard of ‘Kimono’ ? This elegant and beautiful Japanese traditional costume, was first worn by people 1300 years ago, has deeply rooted among the people’s heart. Yuzen is one of the most original kimono dyeing methods. Presently, there are only few top craftsmen left with the skills to make Yuzen-style kimono. The fabric used in Yuzen is the finest quality of silk made in Japan. There, top craftsmen who has long experience draw pattern on it, thus enabling them to make colorful and elegant kimono with fine patterns. Thanks for their patience and careful dyeing; we can enjoy many wonderful kimono masterpieces. 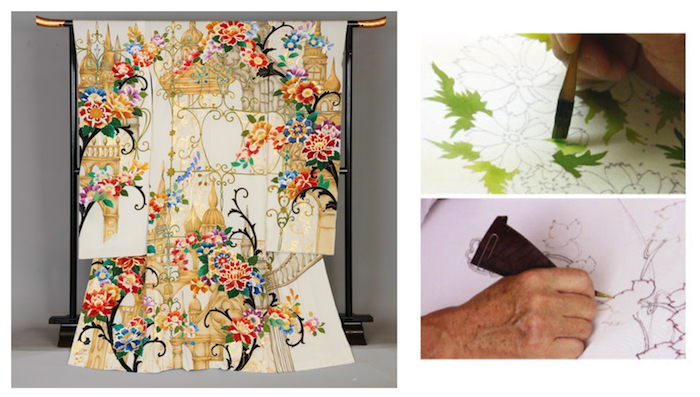 The hand drawn Yuzen reflects the seasonal natural beauty into silk, it is not simply succeeding the traditional technique but also adding the polished sensibility of expert who lived at the time. It is an embodiment of beauty in more sophisticated way. The Japanese sense of beauty elegantly exist there may be telling our generation today the genuine beauty and mind of Japan. Yuzen, structured by patterns based on the rich seasonal taste, scenery and grass and flowers of Japan is a combined artwork developed by the graceful nature in Japan. By combining the various high techniques, one piece of kimono is created in hand drawn Yuzen. How these technique and design are transferred to each step is essential role of “Sensho”, a producer of kimono making. Sensho supervises overall steps and at the same time invents each kimono design and color with his honed sense. Hand drawn Yuzen representing a beautiful tradition of Japan and the culture of kimono, is passed down through generations as evolving in its long history. It is still making a leap forward in various aspects as a representative of decoration culture and an opinion leader in the design world. Works using the kimono fabric: In Japan, we produce new goods using kimono fabric and dyeing techniques. Supported by : Kyoto Prefecture (pending) / Kyoto City (pending) / Etc. *We drive the project forward under the cooperation and supervision of Imagine Oneworld, Inc.
[e-mail] info@someoriren.jp *We accept questions regarding the competiton only by this email. Copyright (c) Organizing committee of the Kimono Design Competition 2020. All Rights Reserved.